UDM Downloads > Visual Lint Professional Edition! 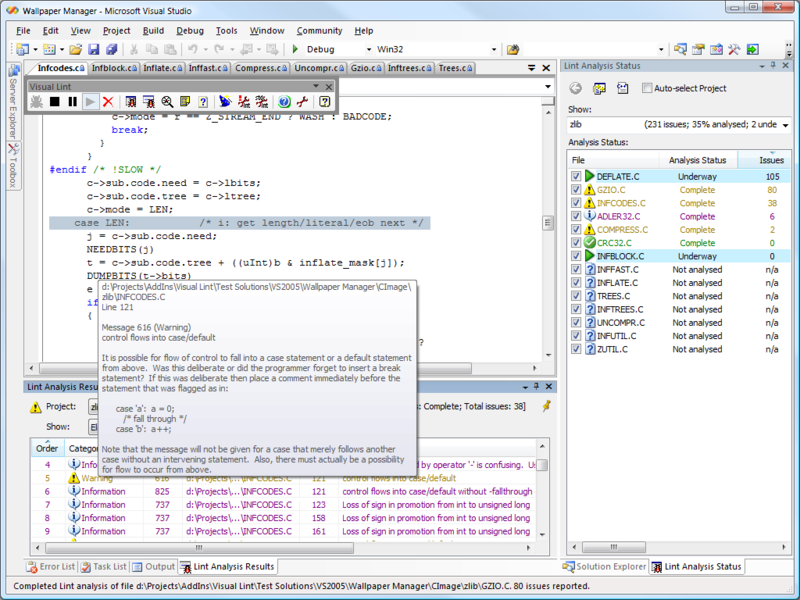 Visual Lint is an add-in for Microsoft Visual Studio and Visual C++ which closely integrates the Gimpel PC-Lint code analysis tool within the Visual Studio integrated development environment. Although PC-Lint does a great job of analysing C++ source and header files for potential problems, it is a generic cross-platform tool and as such is not closely integrated with development environments. This is less than ideal if you want to perform a complete analysis of an entire workspace or solution, and furthermore, it can be difficult to spot the most serious potential problems amongst the mass of results. Visual Lint overcomes this by closely integrating the Lint analysis process with Visual Studio and making analysis results available to the developer using dedicated displays, making it easier for them to act on the warnings identified. Automated background analysis ensures that up to date analysis results are available when you need them. Visual Lint is available in Free, Standard and Professional Editions: - Visual Lint Free Edition allows manual lint analysis to be carried out in much the same way as traditional methods of integrating lint tools into the development environment. In addition, it it also offers dedicated displays and the ability to quickly look up the meaning of a particular lint message. - Visual Lint Standard Edition adds features such as automated background analysis and HTML reports, and is focused on automatically presenting relevant analysis results to the developer as he or she works on files within a solution. The capability for automated re-analysis of files where necessary ensures that up to date analysis results are always available to the developer. - Visual Lint Professional Edition offers additional features more applicable to advanced users, notably whole-project analysis, the ability to define custom categories of lint messages and use custom lint configurations on a per solution or per project basis.